Bougainvillea has brightly colored flowers in spring and winter. Bougainvillea is popular in the southern United States, where this flowering evergreen vine can grow up to 12 feet long. If your dog eats bougainvillea, seek veterinary help -- this plant is classified as mildly toxic to dogs and children. Bougainvillea can grow as a hedge or a tree, or as ground cover. The vine's blossoms range from purple to scarlet, pink, orange, red, white, yellow or lavender. Flowers appear early in the spring, and in the winter. Bougainvillea is usually found in warmer parts of the United States, where it may grow wild or be cultivated as a garden plant. Bougainvillea is classified as mildly toxic to dogs. This means that a dog may or may not experience side effects from eating bougainvillea. 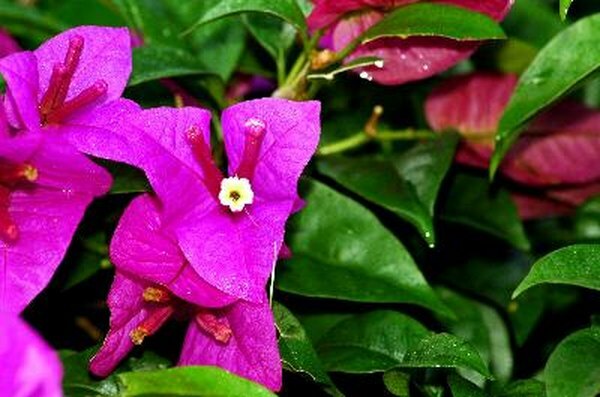 The most common side effect of a dog eating bougainvillea are gastrointestinal symptoms including nausea, vomiting or diarrhea. Call a veterinarian if your dog experiences ill effects after eating any plant. Bougainvillea plants may present other dangers to dogs. The blossoms of bougainvillea attract both butterflies and native bees. If your pooch is nosing around the bougainvillea, it runs the risk of getting stung by a visiting bee. Any bougainvillea -- or other plant -- that has been treated with pesticides may be dangerous if eaten by a dog. If you think your dog has eaten a pesticide-tainted plant, get immediate veterinary attention. A simple way to reduce the risk of bougainvillea poisoning your dog is to grow the vine in areas of your yard that your dog doesn't access. You might grow bougainvillea near the roadside in front of your house, if your pet exercises in a fenced backyard. Alternatively, you could grow bougainvillea trees in tall pots that place the plant out of small dogs' reach. Protective fencing in a planting bed can keep your dog away from the bougainvillea itself. How Can Dogs Sense Seismic Waves?